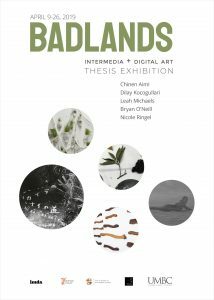 Since the inception of the INTERMEDIA AND DIGITAL ARTS MFA Program at UMBC in 1992, the Center for Art, Design and Visual Culture has presented the IMDA MFA Thesis Exhibition on an annual basis. The exhibition is presented each spring semester. Past exhibitions have included installation, performance, film, video, photography, animation, interactive art, sculpture, and audio works, as well as painting, drawing, and print media.